Though visiting Bocas del Toro wasn’t a part of my original itinerary, I booked a last minute trip because everyone—literally every other tourist I met while in Panama—recommended it to me. Happy to say, it was the highlight of my time in Panama! I filled my days with boating between the islands; watching for dolphins and birds; snorkeling the crystalline bay; searching for starfish; tanning on the beach; boating the inky waters; shopping for souvenirs; and enjoying my very first surf lesson! If I’m lucky enough to go back, my first stop will be booking another lesson at La Buga; my surf instructor, Jose, was fantastic. And, of all the places in Bocas, you have to visit Red Frog Beach: the lush rain forest, soft white sands, and Caribbean music playing in harmony with crashing waves swept me straight into paradise. I stayed at the nice and quiet Hotel Olas on Isla Colon—and I found the wifi to be surprisingly good. While enjoying a morning coffee there early Sunday morning, I met 79-year old Billy, a lifelong deep sea diver and treasure hunter. After listening to his fascinating stories for nearly an hour, I asked him if I could join him on his way to the home he built for his two adopted Panamanian daughters. 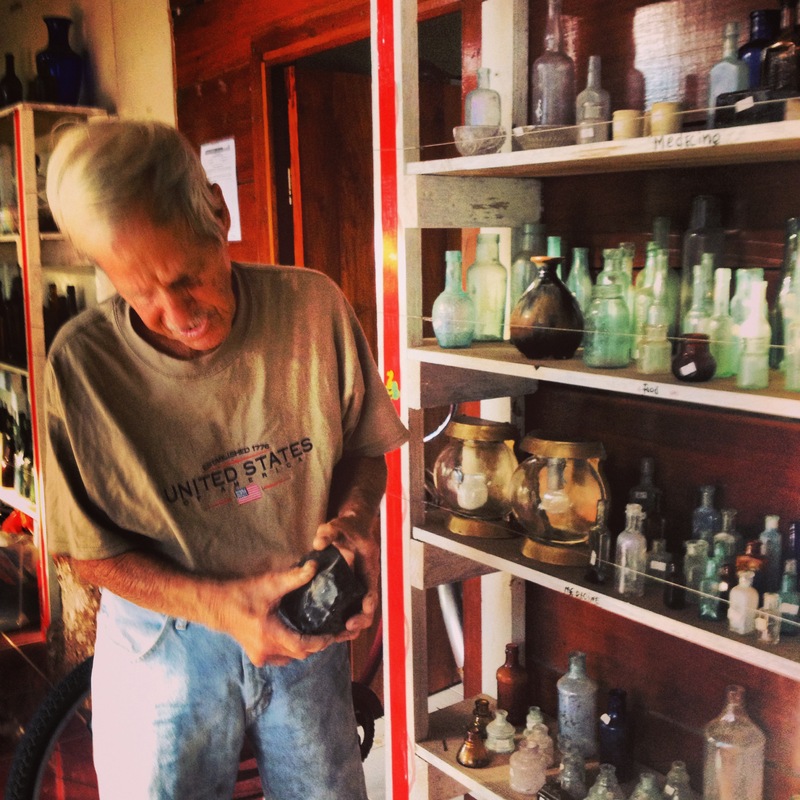 On the front of the house, he built a storefront where they sell the antique bottles he rescues from the ocean floor. The proceeds pay for the girls’ education. I was so captivated by his stories and generosity that bought one: a half-pint glass milk bottle, embossed with a seal that reads “Marin Dairymen’s Milk Co. Ltd. S.F. Cal.” Crazy to think of how far that bottle traveled—just for me to carry it to the next stop on my journey…San Francisco! I love this!! So glad you shared. And you look absolutely gorgeous!